Thie title was first published in 2003. Computer technology and changing student needs have prompted universities to develop modern learning centres offering both virtual and physical learning space fit for all types of study and research. 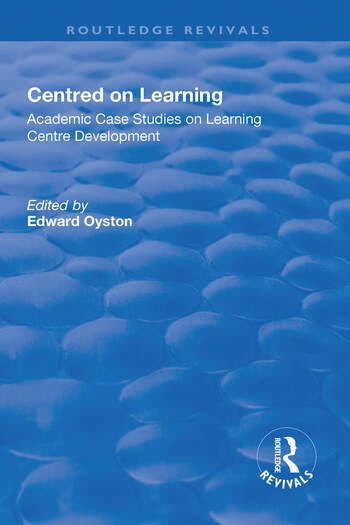 This book demonstrates with detailed case studies how the learning centre model has been introduced at four UK universities with different constraints and priorities: Sheffield Hallam, Leeds Metropolitan, Aberdeen and Lincoln. The authors start by outlining the national higher education context and other internal and external drivers for change, then explaining how these shaped their particular centre's development as they underwent radical change in role, organization, range and nature of service provision - particularly the use of IT in learning and teaching support. Highlighting the differences between the institutions, authors from the four learning centres analyse the implications of changes for staff - in terms of working practices, interdisciplinary skills and internal culture - and how problems were managed. They go on to describe how the needs of all types of students were considered and to what extent, from both student and staff perspectives, they were satisfied. A whole chapter is dedicated to the process of building new partnerships with academic staff and other university service providers - essential for operational convergence and integrated service provision. The following chapter focuses on the development of the physical environment and how the building itself is adapted to modern teaching and learning models. The book ends by outlining the evaluation process and suggested next steps for further improvement. Appendices include sample job descriptions and person specifications. Demands for greater efficiency and responsiveness to student needs have to be met in the context of institutional strategies and priorities. This book offers an insight into four universities' different experiences which will help those at the forefront of such. Contents: Introduction; The changing picture of higher education, Claire Abson; Organizational frameworks, Edward Oyston; The changing staff experience, Jo Norry; The student experience, Alison Ward; Building new partnerships: changing institutional relations, Kay Moore; Building new environments: the physical space, Roger Hines; New environments: the environment for learning, Alison Hudson; Looking over the horizon: a future perspective, Graham Bulpitt. ; Appendices; Index. Edward Oyston is Head of Technical Services and Development, Learning Centre, Sheffield Hallam University. The book’s contributors and editors are drawn from the learning centre staff of all four featured universities.